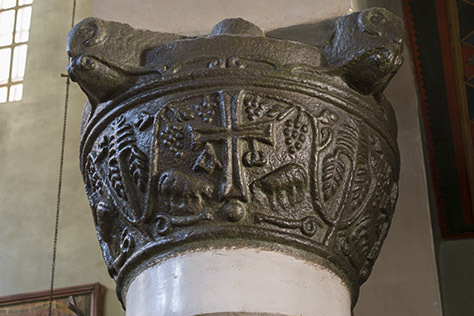 All of the capitals in the sixth century basilica are carved from solid blocks of granite. The capital of the westernmost column on the north side of the church has four projecting corners where it meets the arches above it. These are adorned with rams’ heads. Below, four crosses placed at the cardinal points of the compass alternate with palm trees bearing dates. The whole composition is united by an undulating vine bearing bunches of grapes. Beasts and serpents bow beneath the power of the Cross. Suspended from its horizontal arms are the Greek letters alpha and omega. Thank you Fr. Justin for showing us this beautiful carving, and as we approach the Sunday of the Veneration of the Cross, reminding us of the healing power of the Cross. The quote from Revelation is particularly helpful for me in replying to an isolated Orthodox Romanian woman who emails me from her home in a remote, small, Shetland island. Greetings to you and all the brothers from St. Sunniva Skete in Unst, another Shetland Isle. Father Justin, I am not really sure how I stumbled upon your blog but it is purely radiant! Thank you! Dear Jeff, Surely the world would be a very different place if more people were aware of this radiance. Perhaps it must be discovered first by those seeking it. hello father Justin, what a blessing to find your blog. I love this capital and thank you for sharing it with us.